Given the 32nd Anniversary of the Three Mile Island partial nuke meltdown and the ongoingÂ crisis in Japan, I thought it would be a good time to repost a link to a superb BBC documentary on the history of civilian nuclear power. Please watch this BBC documentary by Adam Curtis “A is for Atom“. It begins withÂ the quasi-religious utopian origin of the nuclear technology and virtual public worship for scientists that spawned the phrase “nuclear priesthood“. This is the period I was born and educatedÂ in, andÂ it still resonates. I can still recall my disillusion with science, which really didn’t begin until college, as I learned of the social and environmental consequences of science and technology abused under a corporate capitalist system. The documentaryÂ shows how the heroic postwar scientists and technologistsÂ were quickly co-opted by the politicians and dominatedÂ by corporate interests, particularly at GE and Westinghouse. 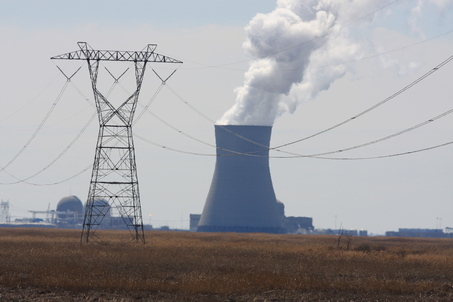 As politicians andÂ industry PR oversoldÂ the utopian benefits of the nuclear power genieÂ (the way to a better world – electric power too cheap to meter – on the threshold of a new age – even your toothpaste may be a product of the atomic age),Â the regulatorsÂ were boxed inÂ and lacked theÂ effective power to control theÂ nuclear industry. “after having told the public that the nuclear technology was safe, we just couldn’t admit thatÂ we were wrong’ according to one scientist. There are incredible interviews with scientists and regulators, in US, Britain, and Russia. InterviewsÂ with scientists and regulators disclose how the nuclear industry deliberately concealed true risks, and cut corners on safety.Â Government regulators admit that they were pressured toÂ cut costs and expedite approvals of construction of excessivelyÂ scaled up,Â dangerous designs andÂ technology. For example, long before the Wisconsin protests, I noticed that shortly after Christie cancelled the ARC tunnel project, similar public transit projects were killed in Ohio and Wisconsin, Republican places where Christie had campaigned. My suspicions wereÂ heightenedÂ when our neighboringÂ Pennsylvania Republican Gubernatorial candidate advocated a regulatory policyÂ platform very similar to Governor Christie’s. Then after the fall 2010 election,Â Maine and Florida GovernorsÂ both announced anti-environmental “Red Tape” regulatory rollback initiatives. Press coverage in MaineÂ stated that it was modelled on Christie NJ efforts. Well, it isÂ all much clearer now, thanks to the research ofÂ University of Wisconsin history professor Bill CrononÂ – there really is a vast right wing conspiracy. After watching the sudden and impressively well-organized wave of legislation being introduced into state legislatures that all seem to be pursuing parallel goals only tangentially related to current fiscal challengesâ€“ending collective bargaining rights for public employees, requiring photo IDs at the ballot box, rolling back environmental protections, privileging property rights over civil rights, and so onâ€“Iâ€™ve found myself wondering where all of this legislation is coming from. If youâ€™re as impressed by these numbers as I am, Iâ€™m hoping youâ€™ll agree with me that it may be time to start paying more attention to ALEC and the bills its seeks to promote. Cronon writes about environmental history and I am pleased to note that he recognizes that attacks on the environment are a primary targetÂ and ideological obsession of these right wingers. There are reasons for that. It isÂ because environmental protection involves a strong role for government intervention in so called “free markets” and regulation of powerful corporations -Â both conceptsÂ that are ideologically taboo in right wing circles. I’ve been writing about and trying to get these points across for years – ideology is very frequently the determining factor in environmental policy disputes. For doing this research, creating his own superbÂ blog (Scholar as Citizen), publishing a hard hitting Op-Ed in the NY Times (Wisconsin’s Radical Break)Â and taking on this fight, Cronon has come under attack. A Wisconsin Republican legislator has filed a McCarthyiteÂ public records request for his emails – which the NY Times editorial page blasted today (see “A Shabby Crusade in Wisconsin“. The Republicans over-reach in Wisconsin – home of “have you no shame” Senator McCarthy -Â isÂ really showing the ugly and ideologically extreme agenda that has captured the party. Lets hope Americans finally wake up and fight back, so that the Wisconsin battle turns out to be their Waterloo. [Update 1: while the NY Times editorial page and much of the country are correctly outraged thatÂ a McCarthyite public records request was filed by Republicans tointimidate and silence a university of WisconsinÂ professor, I must note that we reported and condemned veryÂ similar abusive tactics here in NJ. In a hostile move, lawyers representing DuPont filed several Â OPRA requests that personally targeted and intimidated the DEP scientists conducting the PFOA research. Governor Christie is getting national press attention for recent controversialÂ remarks in Nutley, suggesting that he was considering unilaterallyÂ pulling NJ out of the northeast states’ Regional Greenhouse Gas Initiative (RGGI). The RGGI was negotiated by former Governor Corzine’s DEP Commissioner Lisa Jackson, who isÂ now Obama’s US EPA Administrator. But RGGI was enactedÂ by the legislature, an authorization that makesÂ the programÂ a key electric sector componentÂ to meetingÂ the emission reduction goalsÂ of NJ’s Global Warming Response Act legislation. So, Christie again is catering to right wing conservatives, subsidizing major polluters and setting up a battle with the legislature. New Jersey‘s governor is floating the idea that he might take his state might out of the upper East Coast’s greenhouse gas regulatory program, raising questions about the future of the nation’s only operating cap-and-trade system. The comments from Republican Gov. Chris Christie also prompted further speculation about the governor’s presidential ambitions and whether he is catering to national voters’ suspicions of emissions caps. At a town hall last week in Nutley, N.J., Christie expressed concern that the Regional Greenhouse Gas Initiative, or RGGI, is putting his state at a disadvantage because neighboring Pennsylvania is not a participant. He said he would decide within two months about the state’s role in the program, which has been capping carbon dioxide emissions of utilities in 10 Northeastern and mid-Atlantic states since 2008. “Is there enough of a benefit to the state to keep it going, or is it too much of a detriment on business? And the thing I’m most concerned about is that it doesn’t seem to be working in the entire region. The value of these credits are getting less and less as we continue to go further and further out, and so the value of the program is becoming less and less,” Christie said in response to a question from the audience. “And in addition, I’m concerned about the burden that it places on our businesses, making them less competitive with Pennsylvania, because our businesses have greater costs involved than in Pennsylvania. So we are evaluating all that, and within the next two months, I’ll give you a definitive answer on whether we are going to continue it,” he said. Of particularÂ significance is that RGGI has been targeted by the billion dollar right wing Koch brothers, anÂ oil and chemical industry giant. The Koch’s areÂ the money behind the TeaParty and the failedÂ attack on California’s global warming legislation known as AB32. NJ’s Global Warming Response Act was modelled on California’s AB32. The group Americans for Prosperity, which has been running advertisements against RGGI, has an active presence in the state via Internet postings and state meetings. The state director of the group, Steve Lonegan, slammed the “RGGI scheme” at a local event last week, partially because of what he called “speculators” playing the carbon market, according to NorthJersey.com. Americans for Prosperity was co-founded by oil billionaire David Koch. It is not clear whether New Jersey law allows Christie to unilaterally leave the initiative, said one legal expert. “If he were to try it, there would most certainly be a legal challenge,” said the expert. According to official RGGI documents, the other participating states in the Northeast and mid-Atlantic would “appropriately adjust” allowances bought and sold in the trading market to account for the withdrawal of one state. In the case of a New Jersey departure, the issue would be more political than technical, at least initially, said Stacy VanDeveer, an associate professor of political science at the University of New Hampshire. The program’s cap on emissions is too small at this point for any New Jersey action to matter much in terms of how the trading platform operates, he said. Instead, the action of state representatives during an upcoming regional review of the initiative is more important, he said. New Jersey’s sheer size — and percentage of emission allowances — means its viewpoint could sway the outcome of things under consideration, such as whether the cap is strengthened, he said. It also takes “momentum away” from the program at a time when climate legislation is defunct on Capitol Hill, he said. The initiative is also facing a challenge in New Hampshire, where Republicans have moved a bill through one chamber of the Legislature to exit the regional plan. And once again, the Christie Administration’s signals are crossed. Spokespeople in the governor’s office and the New Jersey Department of Environmental Protection denied there was any movement to leave the program. “At the moment, we’re not going anywhere,” said Lawrence Ragonese, a spokesman for the Department. A Christie official said it would be crossing a “bridge we not have come to” to speculate about how the state procedurally would leave the greenhouse gas initiative. At the moment, I think they’re full of crap. In light of recent events (see below COA letter), I thought it timely to provide an update on the Barnegay Bay TMDL bill, conditionally vetoed by Governor Christie on February 3, 2011. As we previously wrote, we look to EPA to enforce Clean Water Act Section 303(d) TMDL requirements that currently apply to Barnegat Bay, and toÂ hold NJ DEP to the TMDL commitments made in a 2002 EPA/DEP Memorandum of Agreement. There are 2 very specific and transparent regulatory steps for EPA to take to enforce this commitment. EPA has adequate legal and funding leverage over DEP to make both happen, and has used this leverage previously plenty of times, e.g. a threat to withold EPA funds and federally implement the TMDL program in NJ is what led to the 2002 MOA. I was in the room representing DEP Commisioner Campbell when the threat was made in 2002 by Kevin Bricke of EPA Region II. First, EPA must demand that the entire Barnegat Bay be included by NJ DEP on the 2010 impaired waters list, as impaired for failing to comply with nutrient policies in the NJ SWQS and failure to attain designated use of aquatic life support, fisheries, and direct contact recreation. There are multiple lines of existing scientific evidence and scientifically robust water quality and ecological indicators that support this impairment determination (see eutrophic condition indicators in Rutgers Professor Kennish powerpoint). DEP could support an impairment determination under the same “weight of evidence approach” that DEP uses to support other site specific regulatory determinations (such as the Category One Waters designation, which is based upon an integrated ecological assessment). DEP lawyers have advised that this methodology – and similar site specific applications of scientific judgement – do not require public notice and rulemaking adoption. Similarly, the current aquatic life criteria use support assessment methodology used to determine designated use attainment relies on best professional judgement in interpreting the macro-invertebrate sampling data and assessment methodology. DEP public noticed a draft 303(d) impaired waters list in November 2010 and is scheduled to submit the 2010 303(d) list to EPA for review and approval this spring. Second, EPA must demand that NJ DEP include the Barnegat Bay on the DEP’s 2010 2 year TMDL priority list. This priority list was published for public comment in November 2010 and will be submitted to EPA for review and approval this spring. If EPA and DEP deliver on these two steps, there is no need for any NJ State legislation. Last, we noted that at the state level, the ball now is in the Legislature’s court. We urge the Legislature to either let the bill die or over-ride the Governor’s veto language. Since over-ride majorities are unlikely, the best path is to let the bill die and informally urge EPA to act. We went into great detail laying out our reasons why the Governor’s CV is an unacceptable step backwards. Basically, among other things, the CV language does not mandate that a TMDL be conducted by DEP. The CV would allow DEP to avoid tough regulatory decisions because it would allow DEP to delay – perhaps indefenitely – making a formal “impairment” determination, i.e. specifically included in the CV language are new legal factors DEP must consider including: 1) lack of adequate science; 2) lack of adequate data; 3) lack of a numeric standard for nitrogen; 4) economic considerations; 5) or exercise of State discretion under the Clean Water Act. An impairment finding is a pre-requisite to a TMDL, so regardless of the 3 or 5 year period for a TMDL, if there is no impairment finding by DEP there can be no TMDL and obviously no TMDL implementation. We were disappointed – but not surprised – to learn that COA is pushing to have NJ environmental groups sign on to a letter to the Legislature is support of the Governor’s CV (see below). We urge those groups not to do so and are willing to engage in discussion as to why. But it is obvious that we have more than a failure to communicate here, as there are glaring flaws in COA’s analysis of the CV and their very selective excerpts of same. First off, COA fails to note that DEP has long opposed a TMDL on the Bay and that, most recently, DEP testified AGAINST a TMDL when the bill was up before the Senate Environment Committee (I was there to testify at that hearing, COA did not). Second, the COA letter naively quotes a key sentence from the Governor’s CV totally out of context. In the CV language COA quotes and praises, the Governor – consistent with his “common sense” regulatory policies in Executive Orders 1-4 and the Red Tape Commission – was disparaging the regulatory mandates and enforcement aspects of a TMDL, especially federal oversight and control by US EPA and the adverse economic cost impacts on property owners and local governments. That’s why the Governor’s 10 point Barnegat Bay plan is based on voluntary local partnership and incentives, and why it lacks any regulatory teeth and enforcement tools (the Plan even says it will “determine if a TMDL is feasible” – and retains the lead of the non-regulatory Barnegat Bay Partnership). And of course, given the strong political opposition by the Ocean County Freeholders, the Governor is not going to undercut his Republican colleagues. Is COA on the same planet? Are they that naive? Or incompetent? Or just providing cover for the Governor? And last, COA simply fails to understand the CV language that impacts the DEP impairment determination. If the Governor and DEP were seriously committed to a TMDL, they would take the first two steps outlined above to get the TMD process underway. We write to you today to express our support for Assembly Bill 3415, the TMDL Bill, which was conditionally vetoed by Governor Christie on February 3rd, 2011. Please inform your colleagues that our groups support the bill as amended by the Governor and urge them to act swiftly to approve the changes. The bill, if made law, provides a tool to ensure that cuts to pollution harming the bay are comprehensive and strong even with the Governor’s amendments. A TMDL, to quote the Governorâ€™s conditional veto, â€œis ultimately an enforcement tool under both state and federal law that compels parties to implement measures to reduce the amounts of pollutants they discharge. Although the Governor’s changes may slow down the timeline for adoption of the TMDL, changed language adds an additionally enforceable mandate that we find beneficial for the Bay that the TMDL must be adopted and implemented within the timeframe of 5 years. Also, nothing in the amended bill would preclude the DEP from implementing the TMDL before the 5-year deadline. The environmental community plans on helping to develop the state of science and policy in the Bay to see that this process is as quick and thorough as possible. Encouragingly, the Governor’s changes keep the provisions of the original bill that expand the DEP’s use of science and they leave unchanged the section of the original bill that requires the DEP to use all its existing authorities to “to the maximum extent practicable to reduce sediments and nutrients during the study and the development of the total maximum daily loads.” To that end, our groups look forward to meeting and discussing with you additional approaches to stemming the tide of pollution flowing into the Bay. In closing, we want to thank you for your leadership to protect New Jersey’s natural pearls – the Jersey Shore and Barnegat Bay – and recommend that the Governor’s conditional veto be accepted by both Houses of the New Jersey Legislature. Turnpike Authority Illegally Clearcuts 30 Miles of Trees and Lies About It – Where’s Christie? Drew Fishman, an agent with ReMax Atlantic and a former president of the New Jersey Association of Realtors, said there is no question that the tree removal will affect property values. Feeney said the agency believes any concerns about runoff are unfounded because the tree stumps and underbrush that remain will prevent it. Other concerns about aesthetics must be balanced against the need for the project, he said. This $6 million tree-cutting project is a debacle. The parkway is aesthetically marred. What was lovely greenery is now a virtual moonscape. Meanwhile, the natural sound barrier between nearby homes and the highway is gone. And so are the positive environmental effects of trees, including flood prevention and wildlife habitat. There are letters between the Turnpike Authority and the DEP going back several years in which the Turnpike Authority describes the tree removal on the Parkway as part of the widening project. How could DEP let this happen? That’s what I want to know. But when reached by phone on Tuesday, Van Drew said that more of an explanation is needed. “I have been dealing with this situation for a while, before the article came out, and I was told in great detail by the head engineer that this was something being done solely to protect drivers. And I could understand if it was just a matter of cutting a few trees and branches back, but this looks like a logging operation.” If you were to fly overhead, it looks like we were strip mining” said Van Drew, adding the clear cutting of entire sections of median now could actually put drivers at risk of head-on collisions. â€œAnd what if the money never becomes available for the widening? What was this all for? I think they’re spending tax dollars to do this clearing and make the Parkway less desirable. So, what happens when real journalists at the Atlantic City Press document massive environmental abuse, serious violations of DEP regulations, and blatent lies by NJ Turnpike Authority managers? Where is our Governor? Crickets. Where is DEP enforcement? AWOL. Can you imagine the DEP enforcement response if a small home builder cut down hundreds of acres of trees at the edge of wetlands and the environmentally sensitive Pinelands, failed to obtain DEP approvals, and was caught knowingly lying about it to DEP? Yesterday’s superb Atlantic City Press story Tree clearing along Garden State Parkway is also part of highway widening efforts, records show tells exactly that story. The AC Press documents massive environmental abuse, unaccountable arrogance, violations of DEP requirements, and lies. After publicly claiming that the massive tree-clearing along 34 miles of the Garden State Parkway has nothing to do with that roadway’s $900 million widening project, the New Jersey Turnpike Authority has admitted the projects go hand in hand but that it still hopes to avoid replacing the felled trees. The contract for the tree-clearing project, obtained by The Press of Atlantic City through the Open Public Records Act, describes the work as “advanced clearing for the Garden State Parkway Widening Milepost 30 to 64.” and is referred to as such throughout the document. Veronique Hakim, executive director of the Turnpike Authority, which maintains the 172-mile toll road, confirmed that the tree-clearing is being done in advance of a third lane being added in both directions between Atlantic and Ocean counties, a prime growth area. Hakim said the Turnpike Authority does not have enough funds to proceed with the next phase of the road project but that the tree-clearing is being done to enable the project to move forward once the funds are available. The state’s No Net Loss Reforestation Act requires a tree be replanted for every one felled during a construction project that is more than a half-acre in size, such as the Parkway widening. As an alternative to planting a tree, a builder also may put money in a fund devoted to buying and planting trees. …. Environmentalists are accusing the Turnpike Authority of attempting to circumvent the reforestation act to save money. Jeff Tittel, director of the New Jersey chapter of the Sierra Club, said he believes the parkway’s operators are trying to avoid the state’s requirement that trees felled for construction projects be replaced on a one-for-one basis. Tittel and other environmentalists say the authority is playing word games with the tree-cutting project by calling parts of it “routine maintenance” and other parts “firebreaks.” If the tree-cutting is classified as something other than a widening project, the authority could legally avoid replacing trees or could be forced to pay less for the trees removed. So, what is DEP’s response? Do they highlight the ecological significance, condemn the violation, and issue swift and stiff multi-million dollar fines? That’s right – at the highest levels, DEP Deputy Commissioner Kropp – someone known to practice the black bureacratic arts of spin and lies herself – sympathizes with her “sister agency“. The authority has submitted a plan to the state Department of Environmental Protection to mitigate the loss of wetlands and trees, although it did so only after the clearing work had begun, a breach of etiquette if not of the regulatory process. “Admittedly, this is kind of putting the cart in front of the horse. The (tree removal) probably shouldn’t have started until a plan was in place. But we will hold them to the exact same standards as we would have if the plan was in place since day one” DEP Deputy Commissioner Irene Kropp said…. On March 17, Kropp told The Press that the Turnpike Authority submitted a reforestation or payment plan in February for the section of the project that stretches between mileposts 30 and 64.5, but that the plan still had not been reviewed at that time. Kropp said she did not think a sister agency, such as the Turnpike Authority, would attempt to circumvent its responsibilities. But she said the no-net-loss requirements can be unclear, which could be why there is so much debate over the Turnpike Authority’s obligation. Apologetics for massive environmental assaults is the New Normal at the Christie DEP. Pete Dunne, chief communications officer for the New Jersey Audubon Society, said there are some positives that could come from the clearing. When so called environmentalists defend highway clearcuts and violations of DEP wetlands and reforestry requirements,Â yes, we have lost our way.